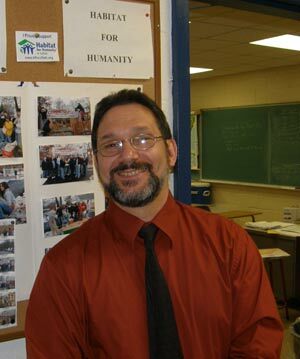 Charlie Trupia has been teaching Social Studies in the Connetquot School District for 23 years, and the impact he’s had on his students has always been apparent. Outside the classroom his work with students in the Habitat for Humanity Club has helped generate thousands of dollars in donations for that organization. This year alone, along with co-advisor Jason Willans, Trupia has helped donate $18,000 to Habitat for Humanity of Suffolk County. Recently Trupia was contacted by the Director of the Honors College at the University at Albany. One of his former students, Eric Koch, singled Trupia out as the high school teacher that had the most influence on his academic life. Koch, of Ronkonkoma, is one of five members of the first graduating class of the Honors College at U.Albany. In a letter from Dr. Jeffrey J. Haugaard, Trupia is recognized for his encouragement of Eric’s academic achievement and potential for outstanding success after graduation. Koch, majoring in Biology, aspires to practice as an Emergency Medical physician. He works as a Patient Care Associate at the Albany Medical Center Heart Transplant Unit, and is also President, Crew Chief and EMT for the Volunteer Ambulance Service. Trupia was invited to join other selected high school teachers to take part in a special dinner at the U. of Albany on May 9th. These teachers, and college professors, are to be honored for the important role they played in this graduating class’ success, and to celebrate their graduation. According to Kathy Schaefer, Director of Volunteers for Habitat for Humanity, Connetquot’s HFH Club is responsible for contributing more funding for the organization than any other school in Suffolk County. This effort can be directly traced back to the dedication of co-advisors Charlie Trupia and Jason Willans. Trupia pointed out that Connetquot’s commitment to HFH this year was $15,000, but that he hoped the club could top $20,000 by the end of the year. CTA Vice President Brad Lindell congratulated Trupia on being recognized by the administration at the University at Albany. “We are always pleased, and proud, to have the professionalism of Connetquot’s educator’s recognized”. Thank you Mr. Trupia for sharing your enthusiasm for knowledge, and dedication to academics with your students.